A shift in my eating plan . . .
*Apologies for the dense text! Of course on a day I have a lot to say, WordPress is misbehaving. As I approach the one year anniversary of reaching my goal weight (still over 100 pounds down as of this week! ), I’ve done a lot of reflecting on what weight maintenance has been like and what I want it to look like for the next year. This year, I’ve maintained my weight by essentially doing the same things I did to lose weight: tracking everything I ate using the Weight Watchers Points Plus program and phone app; exercising regularly but not eating those activity points; and saving my “weekly bonus points” for true splurges and special occasions. I took a week off tracking when we were at Disney World in February for the half marathon but otherwise haven’t missed a day or a meal. Do I really want to do that for the rest of my life? Not really and while tracking has been well documented as a key to success in weight LOSS, I can’t really find it anywhere in research and stories about weight MAINTENANCE. Key factors in studies regarding weight maintenance have been primarily regular self-weighing, maintaining an increased level of physical activity and “avoiding overeating” – I love that one. A big question for me is if I can avoid overeating without tracking my portion sizes. I honestly don’t know. While I’ve gotten used to eating smaller portion sizes thanks to losing weight with Weight Watchers, I don’t know that I’ve learned what a normal portion size is per se. I’ve learned to only eat the portion size I have the points available for, so my portion of shrimp may be 9 oz one day and 3 oz another. Without that limit of “points available”, how would/should I eat? I don’t know that I’ll ever learn this until I practice it. Yes, I may “fail” by gaining a little to start with but that may be a reasonable consequence if it helps me transition to a longer term style of eating. The other thing that has me reconsidering the way I currently eat is a conversation I had with my toddler earlier this month. He’s very into his “favorite” things right now and I asked him what his favorite thing to eat was. His answer, not surprisingly, was tomatoes. My guy loves tomatoes and has cherry or grape tomatoes as a side dish to almost every dinner we have at home. I then asked what Mommy’s favorite was (salad) and Daddy’s (pizza). These are all perfectly reasonable answers, but as this occurred in the setting of a meal where we were in fact, all 3 eating different things at home, it was a little sobering. I would estimate that we all 3 eat the same meal about once a week now. Most nights we eat at home, O has something easy and toddler palatable (beans and tomatoes are a favorite) and I cook something “normal” for my husband. My meal is either something related to Darrell’s dinner, with lots of low-point “swaps” or something quick and easy and low point, like a salad full of roasted veggies or my favorite veggie filled frittata. There are a few light, healthy meals like our beloved tuna melts that we all eat as a family, but those only occur about once a week. While we all sit down to dinner together regularly, I’d really like to work on us sitting down and eating the same meal together regularly! That would mean healthier meals for all of us, which is definitely part of my big goal of having a healthy family, myself included. 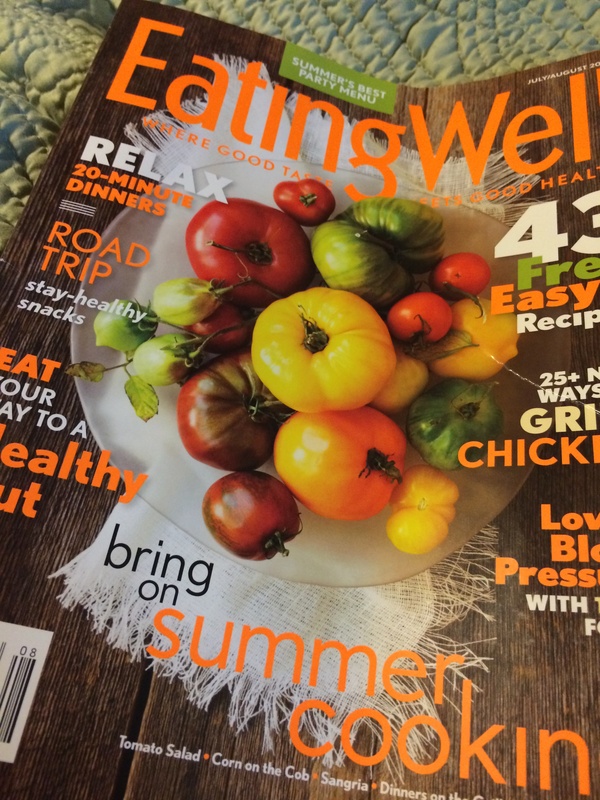 I have all of these fantastic cookbooks and magazines with great recipes to try and yet rarely pursue them because it can be complicated to figure out points with WW. I’m not lazy, just a busy working mom and it’s gotten to be easier to make old stand-bys rather than do the math or portioning to track WW points at night. So what am I going to do? Weight Watchers has clearly been very good for me, in terms of helping me lose 100+ pounds and holding my hand as I “consolidated” my weight maintenance over the last year. I joined Weight Watchers for lots of good reasons, so I am not ready to give it up yet. Instead, I’m going to switch over to the Simply Filling plan. With Simply Filling, you only count points for the foods you eat that aren’t on the “Power Foods” list and those points come from your earned activity points and weekly 49 “splurge” points rather than a set daily allowance. That means I don’t necessarily have to track every little thing or measure out the specific amounts of ingredients in recipes so long as all of the ingredients are on the Power Foods list. That in itself would make cooking healthy meals for my family so much easier! Last night, I made baked ziti with whole wheat pasta, homemade tomato sauce and ground turkey that didn’t count against any of my points tally because all of ingredients were on the approved list and we all ate the same thing from the same pan! Fantastic! The “Power Foods” are fruits, veggies, whole grains, lean proteins and fat free dairy essentially. Veggies like beans and corn that I had to count in the past no longer have a point value. These are all healthier options we should be eating more of , of course, and Weight Watchers theorizes that they’re foods with less abuse potential and more filling. I’m not sure about the abuse potential part – we’ll definitely have to wait and see with that one. I’ve been doing this for a week so far and have noticed a couple of interesting things. – The bulk of my daily diet was already on the Power Foods list. I examined the few things in my regular rotation that I would have to pay Points for and realized that most of them weren’t worth it. Laughing Cow cheese on my toast – not worth it. Half calorie crackers or Pop Chips with lunch – not worth it. String cheese – not worth it. PB2 in my yogurt – TOTALLY WORTH IT. – I’m mentally still in the “save the weekly points” mindset so I find myself going for at least a little walk during the day to get the points to pay for my PB2 at night rather than dipping in my weekly points. I’m sure I’ll get used to it eventually but for now I guess it is a good way to get extra steps in. – I thought the fact that I felt like I was starving every afternoon was due to the fact that I had this mental association of driving home with snacking (fast food in the old days and big cups of fruit nowadays). Turns out, once I started eating edamame with my lunch instead of the half calorie crackers, I wasn’t hungry in the afternoon anymore. Maybe there is something to this Power Foods thing. Interestingly, the edamame are the same 2 points as the half calorie crackers on the original tracking plan, which really makes me wonder why I hadn’t picked something with more nutritional value in the first place. I made the switch to soy milk as it is on the list and almond milk is not. Honestly, a little over almond milk at the moment after the chicken stock incident a couple of weeks ago! For now, I’m going to commit to this plan for a month. To start with, I’ll try only tracking the things that aren’t on the Power Foods list and trying to pay attention to hunger signals to learn how to eat the healthy stuff like a normal person. I like I still have the ability to eat things that aren’t on the Power Foods list, just by earning activity points and managing my weekly points well, so I haven’t felt restricted so far. 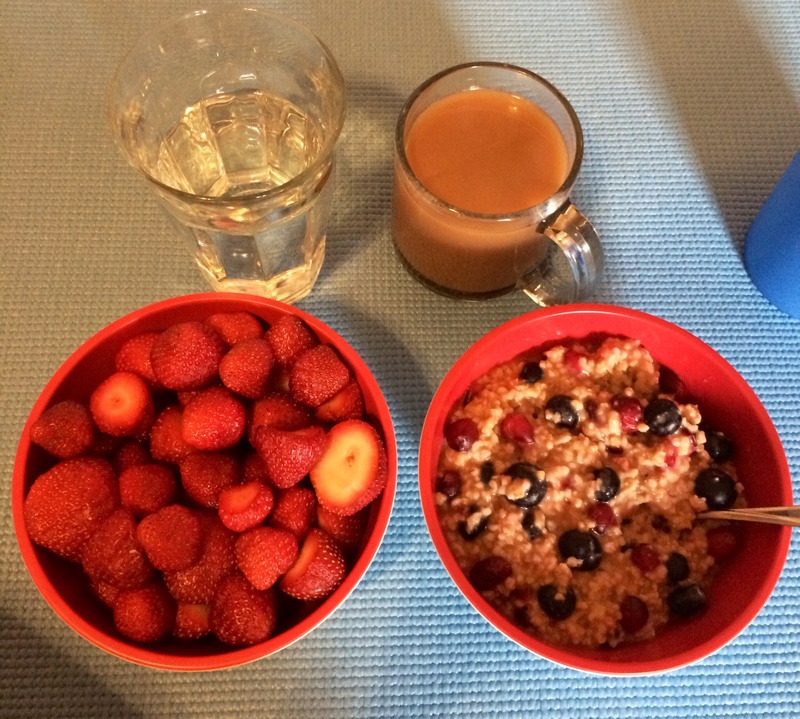 I’m going to keep with my regular weigh ins (at least once a week) and if things are getting too out of hand in the first couple of weeks, I’ll go back to tracking everything, even the Power Foods. If nothing else, at the end of this I’ll have had some practice with hunger cues and hopefully have some new healthy recipes for the whole family so I haven’t lost anything by trying this out. I also have the calorie burn “buffer” of starting my new half marathon training plan this month, so that should take care of the “maintaining an increased amount of physical activity” part of weight maintenance. This feels like transitioning into real maintenance, which is a little scary but exciting too with the prospect of being more like a “normal” person and less a “former fat girl” (although I suspect I’ll always be the latter and actually am okay with that). 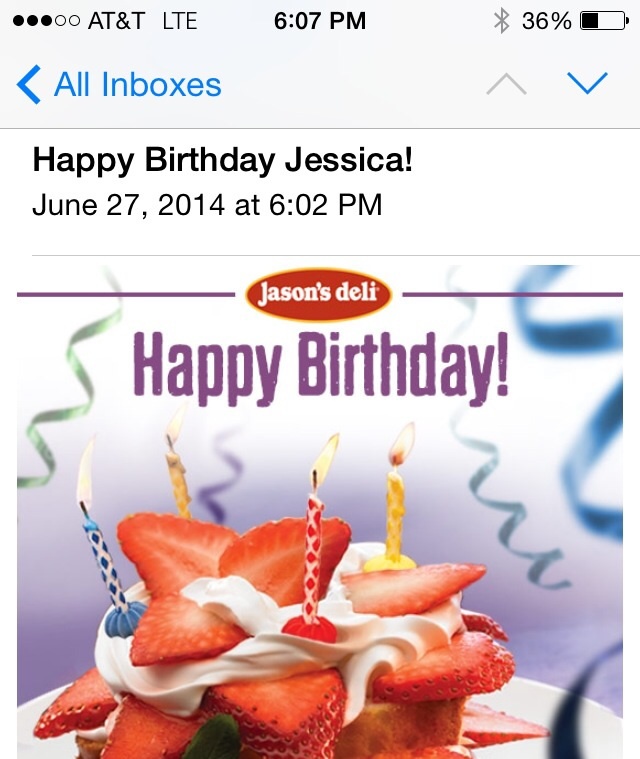 My birthday appears to trigger this transitions for me – joining Weight Watchers to lose weight two years ago, registering for my first half marathon a year ago and now shifting to a different eating style for my family this year. I think this will be an interesting experience for all of us. I’ll keep you posted! Weekly Wrap-Up: Training plan starts tomorrow! I’m excited and nervous that my training plan officially starts tomorrow morning! Excited because I’m looking forward to a new challenge and nervous because this is definitely a more ambitious training plan than I’ve done before. 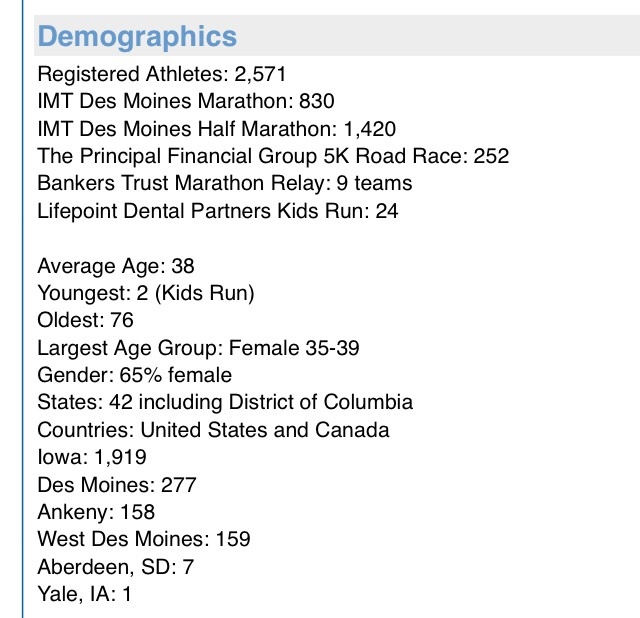 I have to say that I’m very impressed so far with the organization of the Des Moines marathon weekend. They have an app for the smart phone with maps, etc and have sent monthly email updates with training tips and information about the event. It definitely helps build anticipation, in addition to the practical information it gives! Looks like my group (women 35-39 half marathoners) will be the biggest! Monday: An easy, humid 3 miles in the morning – boy am I terrifying in the mirror in my foyer when I come in on these humid mornings! While it is warmer in the evening, it is definitely less humid so I suspect it would feel the same, comfort wise. Every little bit counts, so I took a little walk around the shopping center. 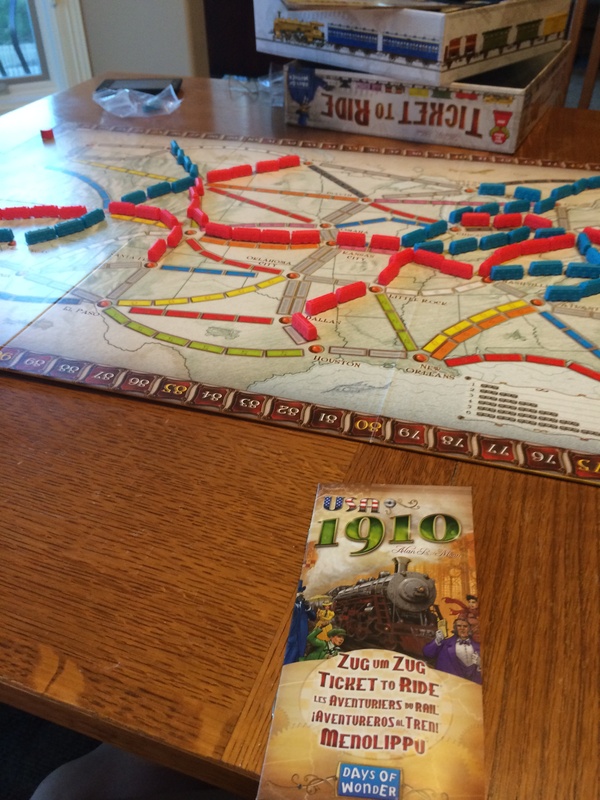 Wednesday: No workout, but I did play a round of Ticket to Ride with Darrell using the expansion pack I’d gotten him for Father’s Day. Game night is as good for overall health as any workout, right? Thursday: 4 miles in the morning before work – it was nice to see that I could get something longer (not much longer, I know) done before work without getting up exceptionally earlier. Friday: I was literally about to step on the treadmill to squeak in a quick 3 miles before I started my call weekend at 5 pm when I got called to come in and help out early. Surely the fact that I was already dressed counts for something right? Saturday: 2.33 miles quickly squeezed in between prepping for a party we were attending that evening and work. I also got lots of sets of stairs in at the party going back and forth between the adult party upstairs and checking on O down in the kid zone in the basement! Sunday: Today, I’m planning on something nice and easy since the training plan starts officially tomorrow. As of right now, I’m at 47.2 miles running for the month, so tomorrow’s workout (3 miles with 3 strides thrown in) will put me over my 50 mile goal for the month of June! How I took a 2 year old to Disney & actually had fun! This is a completely non-running and non-fitness related post, so I apologize in advance! I have several friends considering their first trips to Disney World with their little bitty kids and in giving the same advice to them over and over, I thought it might be worth writing about here as well. 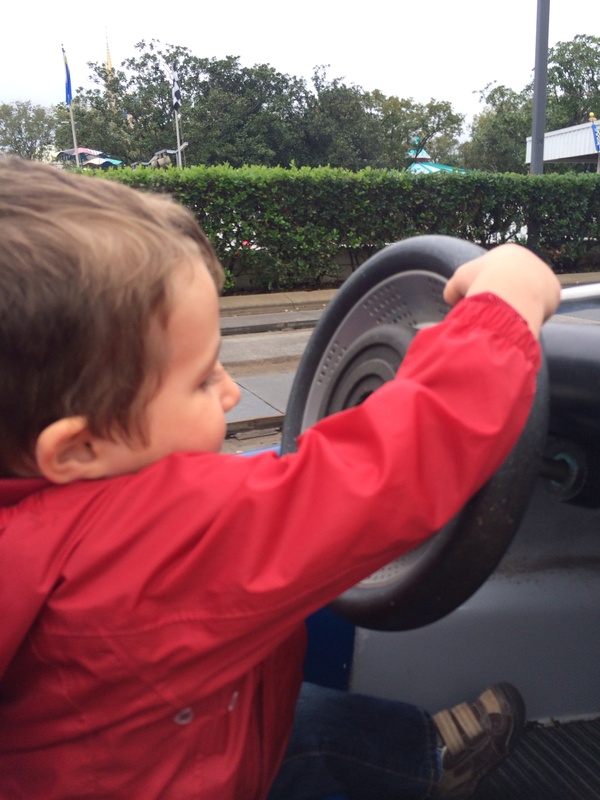 We took O to Disney World for 2 days when he was 20 months old and a week when he was 30 months old and the two trips were so wildly different! 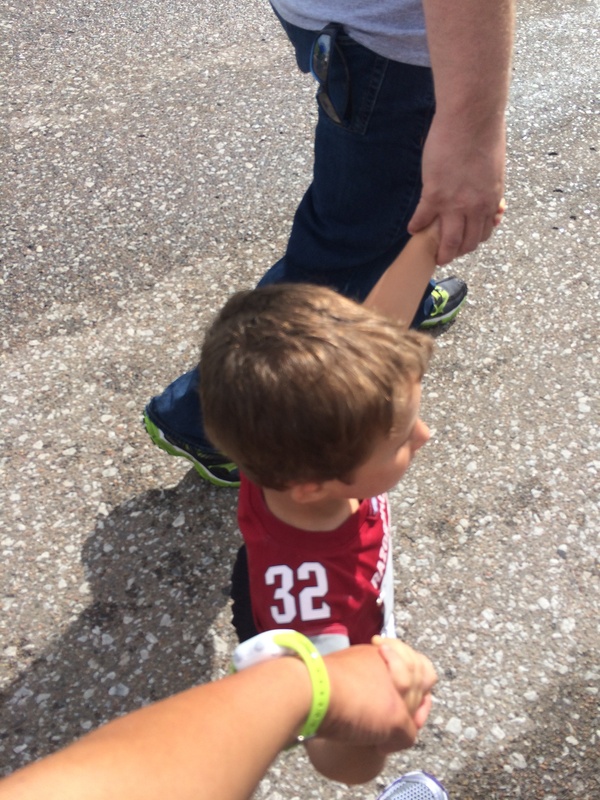 He had such a blast on our trip for the Princess Half Marathon, when he was 2 1/2 years old, and we all had a much easier, less stressful time than on our first trip. I did lots of reading about taking toddlers to Disney World. Definitely check out the Disney Moms Panel as they have answers to lots of questions on their site and you can send in a new one if you’re curious about something you don’t already see in the list. I also linked several articles we found useful down at the bottom of this post. – If your child is less than 3, take advantage of it! 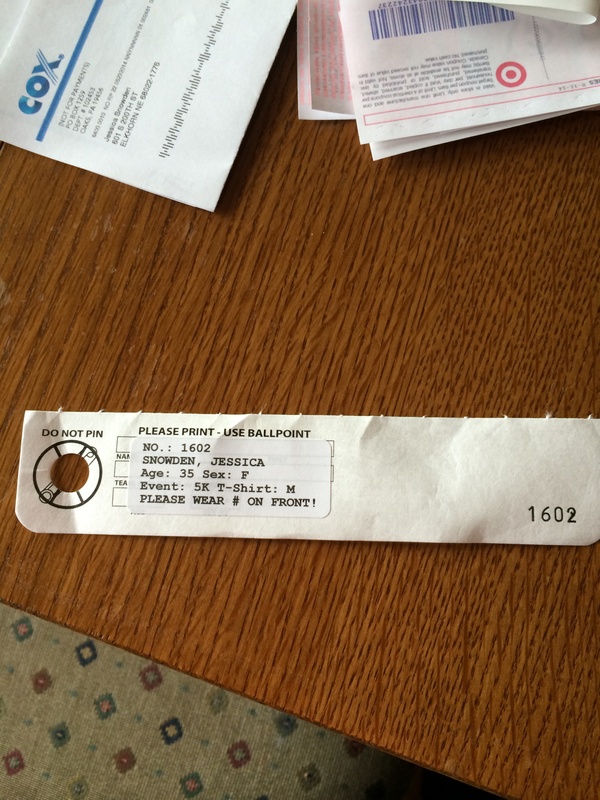 That means they aren’t ticketed, so for the purposes of Fast Pass + they don’t count! They just get to come along with the ticketed adult. That was really handy for the rides O really loved because he could ride with Darrell in the FastPass line, get off and ride again with me on my Fast Pass right after! We did this with Buzz Lightyear and with the Tomorrowland Speedway. This only works if they’re under 3 and not ticketed yet, but definitely take advantage of it if you kid falls in this group. – Similarly, if your child is under 3, they’ll be free at any of the family style or buffet table service dining locations. At counter service locations, they can’t get a free kids meal but the meals are so huge we would just share our food with O and had plenty of food to go around. – Stay out of the gift shops. I know people who end spending an unplanned fortune on souvenirs and treats from the gift shops. We avoided that by just staying out of the stores! I went in by myself a couple of times towards the end of the trip to pick things up, but we tried not to wander into those stores unless we had a specific purpose. Of course, we had a couple of unplanned trips into the store to buy extra clothes for O when he had diaper leaking accidents two days in a row, which brings me to my next tip. – Bring more extra clothes than you think you need for your kid, especially if you have a little boy. There really aren’t many options for little boy clothes in the gift shops in any of the parks. We found a shirt when we needed one but the time we needed some kind of shorts (all in one day – a bad day on the diaper front) we couldn’t find anything at all! O ended up wearing pajamas for the rest of that day because that’s all we could find him in the park and we didn’t have time to go all the way back to our hotel room before our dinner reservation. For little girls, you can of course find a thousand princess dresses, so you could find something but it could add up. Bring at least more set of back up clothes than you think you’ll need, trust me. – Embrace your stroller for all of the nap potential it gives you! We rented a stroller and had it delivered to our resort, which was very handy. O doesn’t use a stroller anymore at home, but with all of the walking at Disney, we definitely needed it. I practiced in the stroller with him at home before we went to Disney and talked about the idea of riding in the stroller to get to the fun stuff faster, so he didn’t balk at the stroller when we got there (a problem we had on the trip when he was 20 months old). The stroller made it easier to get him around the parks and also gave him a nice place for naps during the day. We had some great breaks during the day when he napped in his stroller and we sat people in quiet sections of the parks. My favorite was in Epcot with a Grey Goose slushie – best naptime ever! Oliver actually cried and hugged the stroller when I had to take it back to the front desk the night before we left. *We did not return to the room for naps because I knew O would have just fallen asleep in whatever bus/monorail we used to get back to the room, ruining any potential for a nap when we finally got back to the resort. Thus, we did stroller naps but tried to get back to our hotel room relatively close to normal at home bedtime so we could all rest. That limited the fun night time stuff we got to do with him for sure, but it was worth it in happy baby-dom overall. – Take advantage of the Baby Care Center. Every park has them and even if you don’t need them for diaper changing, they make a nice quiet place for a time out or clothing change or sunscreen reboot. 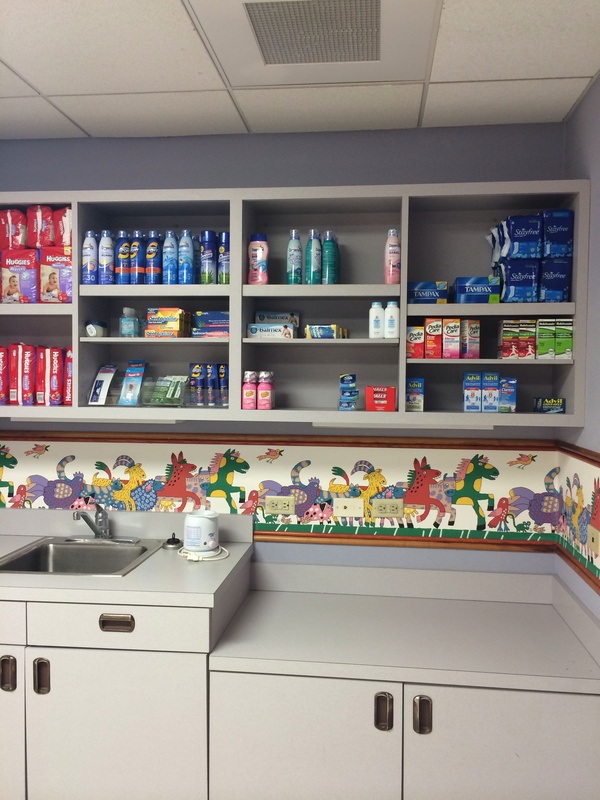 They also have supplies you can purchase in there if you need them and a TV with movies for older kids who need to wait for you deal with siblings. – Disney is famous for customer service for a reason. If you need something, ask someone. The night before our breakfast at Hollywood and Vine (the Playhouse Disney breakfast – one of the highlights of the trip for my Disney Junior loving kid), I sent Darrell up to the concierge desk to ask them about the best way to get over to Hollywood Studios in the morning, as our reservation was before the park opened and I knew bus service might be spotty. They gave us a voucher for a cab, made sure one was available for us when we needed it and even helped us install a car seat in the cab so O could ride safely. We would have never known that was an option without asking and that was so much easier than fighting with the buses! 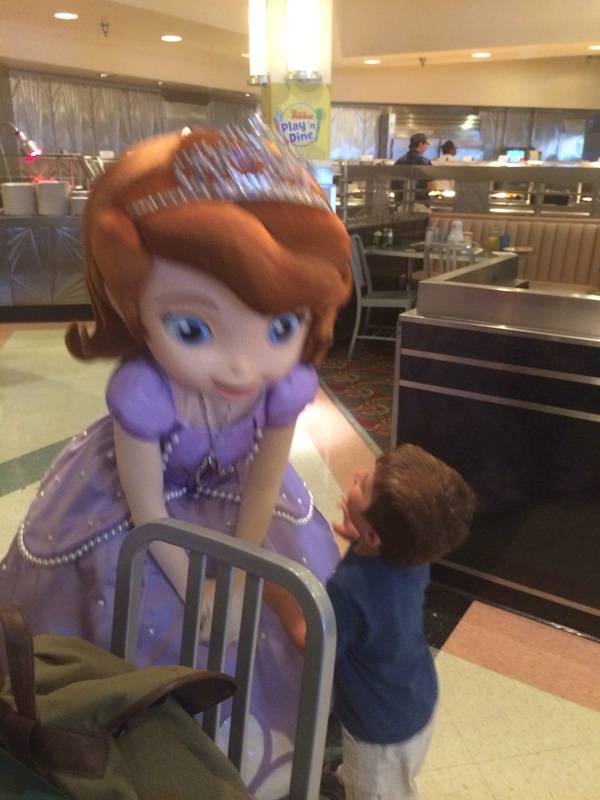 I cannot tell you how excited he was in this moment, to meet Princess Sofia. – Speaking of buses, any days you’re going to be on a bus, try to minimize the amount of stuff you have stored in the stroller. The strollers have to be collapsed on the bus and the bus is always going to be crowded, so you don’t want to be juggling all of those things at the last minute. I hated the buses with a kid and a stroller, truly. We will be staying at the Magic Kingdom resorts until O outgrows the need for a stroller just so we can minimize our bus time. – In addition to practicing in the stroller, we also practicing taking turns and waiting in lines. Well, really I just made a point of telling him what a good job he was doing waiting his turn and waiting in line when we’re doing things like waiting at the grocery store. I think it helped a lot because he already knew that waiting his turn was something he was “good” at when we got to Disney, so he was proud of himself when we would wait in line in the parks. – We’re big fans of character dining. It was much easier to meet characters in the various restaurants on property than waiting in horrendous lines in the parks! 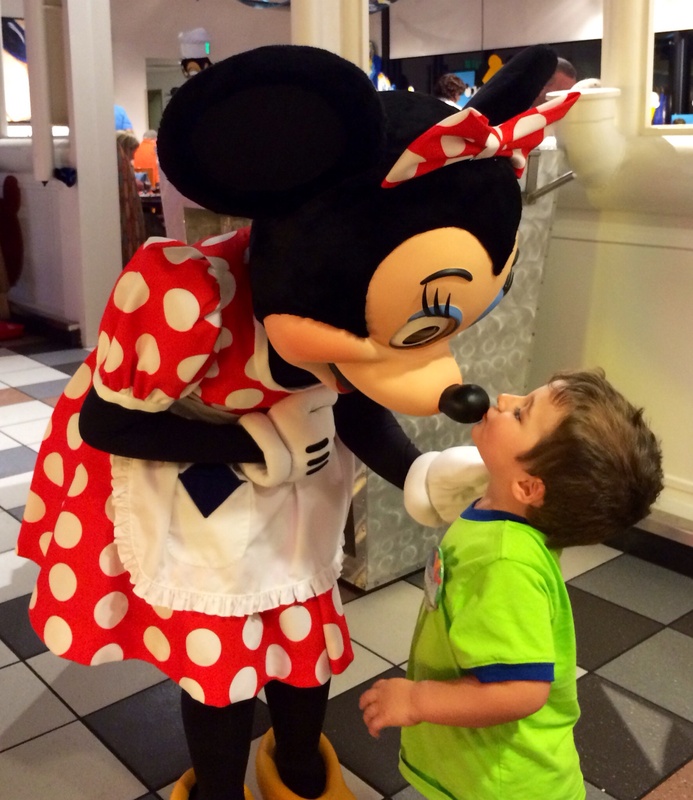 Our favorites were the Disney Junior Play and Dine at Hollywood and Vine and the Garden Grill at Epcot. 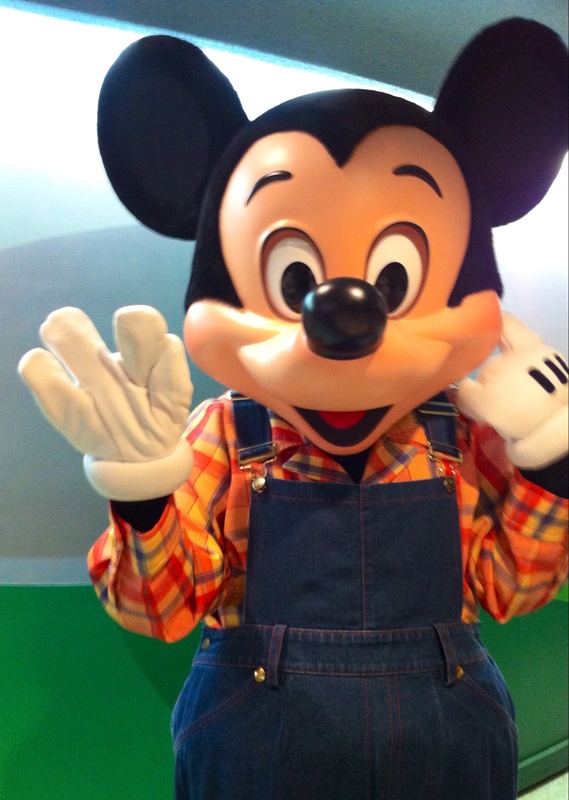 At both locations, O got lots of time to interact with the characters including a dance party at Hollywood and Vine and thanks to the small size of the Garden Grill, several chances to talk to Mickey as he passed by during out dinner. 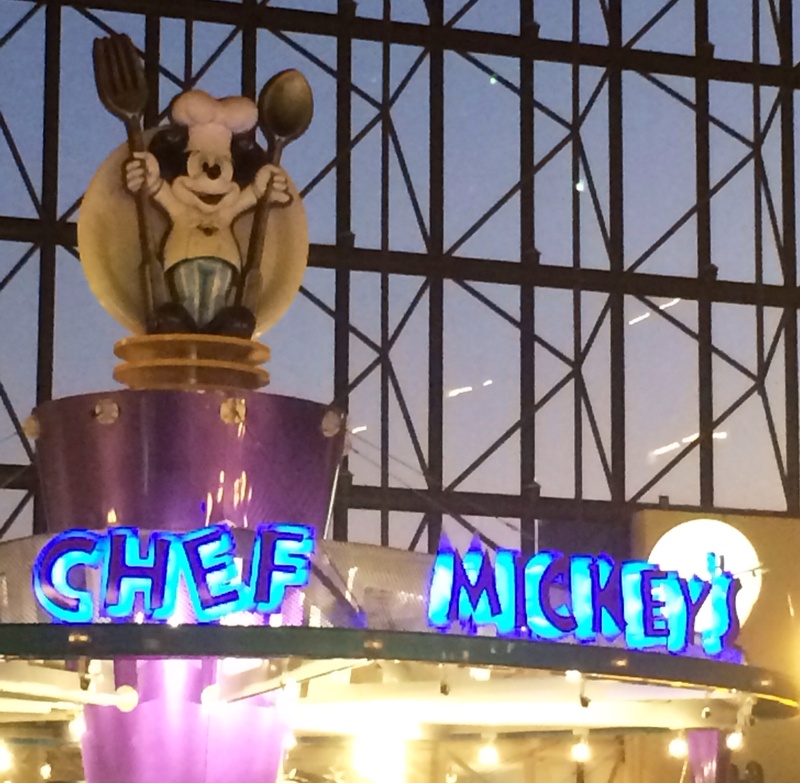 Full post about character dining is coming! It helped any time we saw a character meeting opportunity as we could just tell O that he could wave and tell Mickey we’d see him at dinner later! Oliver’s list of favorite things looked very different than our previous list of Disney favorites. In the Magic Kingdom (where we spent most of our days because there was more toddler friendly rides here than anywhere), he loved the Tomorrowland Transit Authority. It’s a flat boring little people mover for adults, but it was like a roller coaster for him (arms in the air and everything). 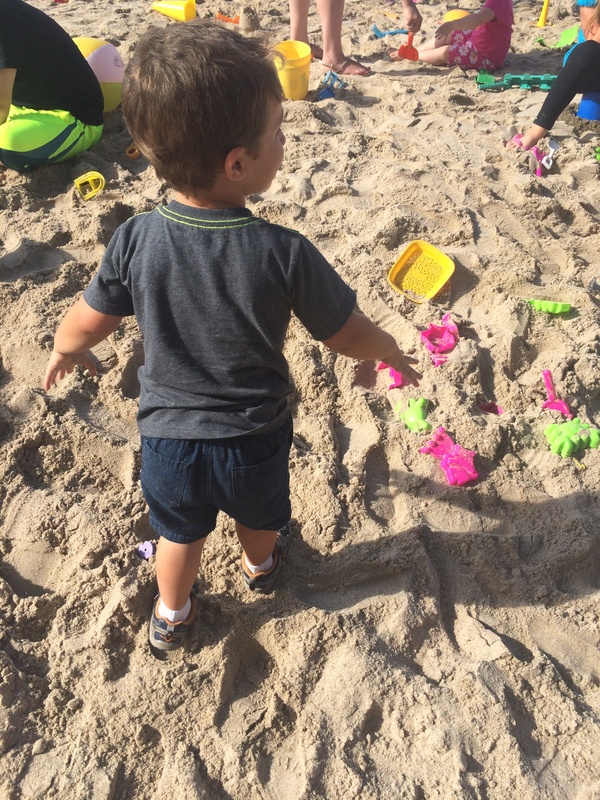 There’s almost never a wait, so it’s a good way for your little kid to feel like they’re on a ride on busy days, even if they don’t love it as much as he did (although I don’t know many toddlers that don’t love it). Naturally, It’s a Small World was also a big hit. I bit the bullet and rode this one with him while Darrell was off doing something fun like Space Mountain. It was worth it to see the look of wonder on his face. There’s a small window in life where this ride is more fun than annoying, I think, and toddlerdom is it. He loved the Tomorrowland Speedway and we took advantage of the fact that he didn’t count as a Fast Pass himself to ride this one frequently, alternating which parent he rode with. Be wary of Dumbo – Oliver loved the ride, but he loved the playground that serves as the waiting for the ride even more. The playground waiting area is genius – you get a pager, like in a restaurant and your kid gets to play on a playground while you wait your turn to ride Dumbo. Even better, you as the parent get to sit down for a bit! However, when the buzzer went off, it was hard to get him to leave the play area to go on the ride and he wasn’t the only kid I saw crying over leaving to go ride Dumbo! In Hollywood Studios, he loved the Honey I Shrunk the Kids playground, which is awesome and you might not visit at all if you didn’t have a little kid! He also really enjoyed the Muppets show once he got the hang of the 3D glasses. We did the Live with Disney Junior show, but it was honestly a bit of a let down after dancing with Princess Sofia at the Disney Junior breakfast earlier in the day (and Doc McStuffins and Jake and HandyManny). We did Toy Story, but I think it moved so fast he never really understood what we were doing. It was Buzz and Woody, so he had fun, but he definitely didn’t get it. In the Animal Kingdom, he would have ridden the Safari over and over if we let him. He loved pointing out all of the animals and correcting us when we got them wrong. The Finding Nemo stage show was also a big hit. In Epcot, we essentially rode the Finding Nemo ride and did the Turtle Talk with Crush over and over and over. He didn’t get much out of anything else, but certainly loved those and the pizza at Via Napoli. 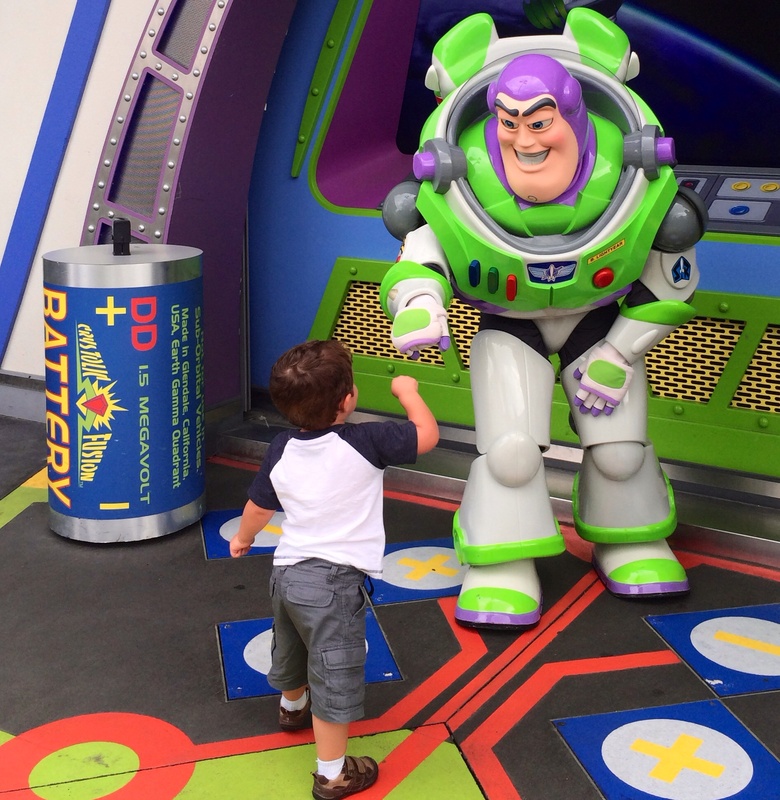 O getting a fist bump from Buzz Lightyear – doesn’t get better than that! I’m so glad we got to have this experience with O and I’m looking forward to our next trip (500 days per hubby) to see how differently he sees and experiences things as a 4 year old! I love sharing the magic of Disney with him. Hopefully these things will help anyone else out there planning to build their own magical memories! 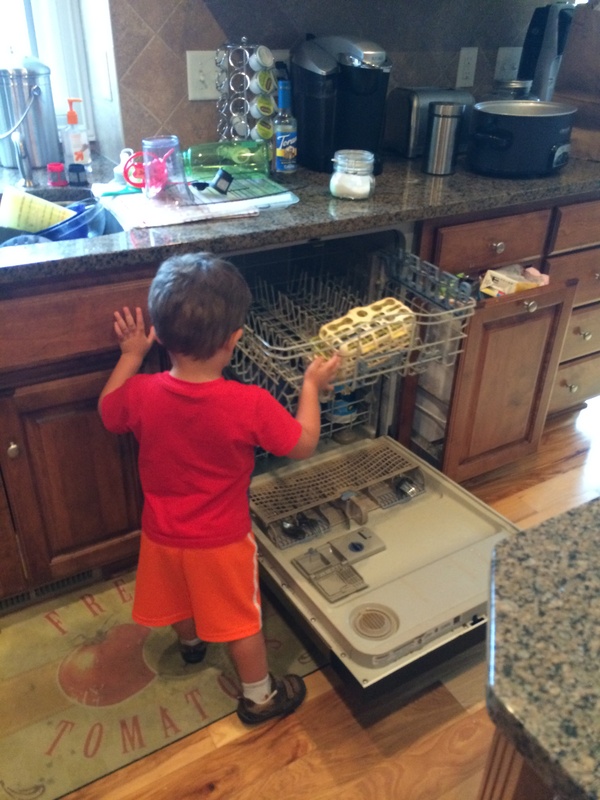 Check out what a good little helper I’ve got! He helped me wash tomatoes and tear basil for dinner and then put away the dishes while I was cooking our bulgur risotto. He always does better with eating whatever new food we want him to try if he helps with the preparation. Last night he tasted the basil and liked it and loved the bulgur, much to my surprise. Fun news from Disney: This summer they are doing a series of events at Hollywood Studios themed after the movie Frozen. I particularly like the idea of the Frozen sing-a-along! I wish we could go play, but I’m pretty sure my husband would balk at adding in another Disney trip with three planned for 2015. 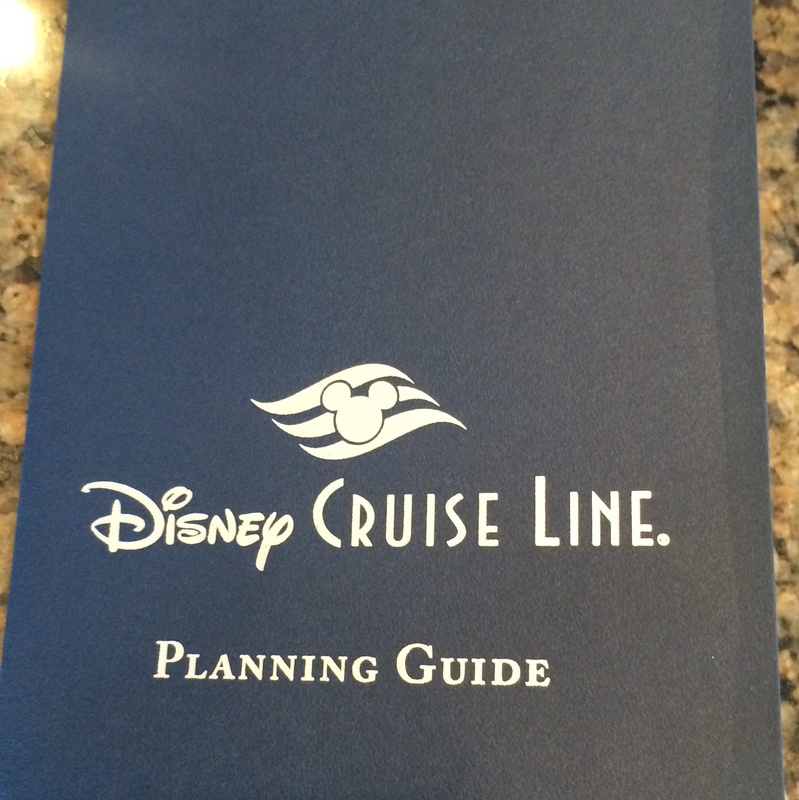 I’m looking forward to hearing reports from people who get to go participate this summer and hopefully it’ll do well enough that it will still be around when we get to go back to Disney World in 2015. 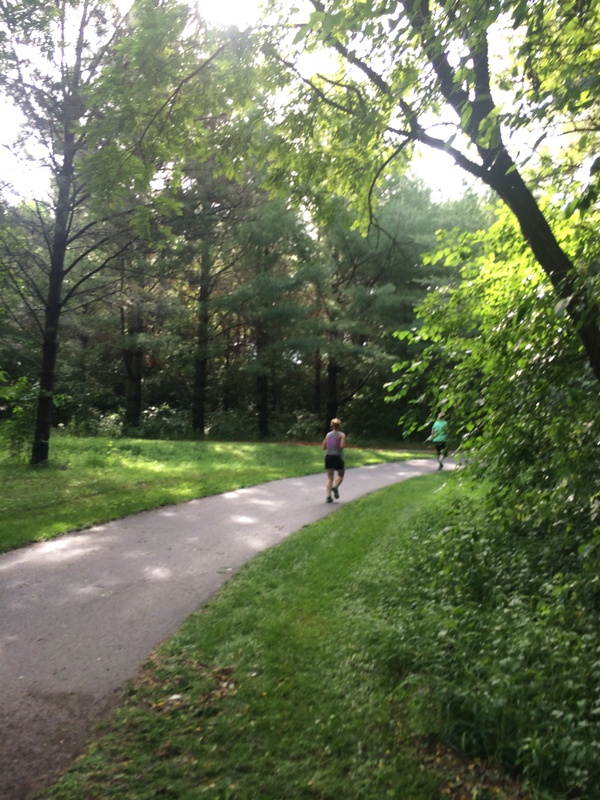 As people start up training for fall races, I’ve seen a lot of conversations about whether or not they can / should have walk breaks as part of their training. If you want to learn more about the potential benefits of walking intervals with running, Google Jeff Galloway because he is definitely the expert in that area. For me, running is supposed to be fun and not hurt too much so I’m okay with walk breaks on certain kinds of runs and straight runs with others. Everybody should do what is comfortable and fun for them. We should be celebrating the mere fact that people are getting out and getting active! Who cares how they are doing it? However, I definitely heard complaints about people on walk breaks when I was the Princess Half Marathon, so I can definitely see where people would be concerned about whether walking is allowed. 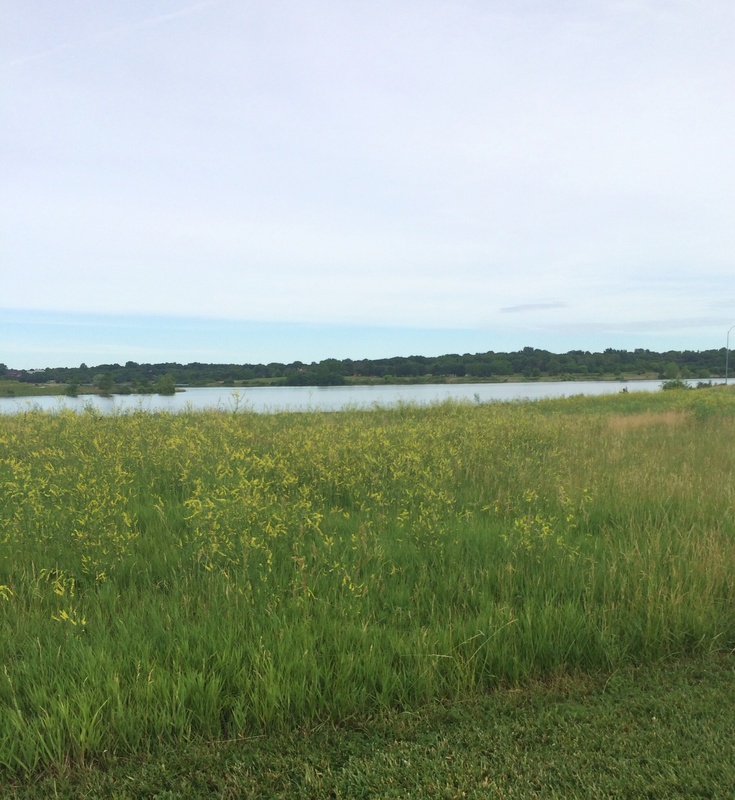 This post from V’s Fuzzy Running (a new to me blog I’m enjoying!) really embraces the idea of being patient, being kind and letting everyone run their own race. In that spirit, I thought I’d start making a point of noticing the things that make me happy each week and Friday seems like a good place to do that. I really enjoy the NPR Pop Culture happy hour podcast and love that they close each week with “what’s making you happy” because they always sound so excited. The world could use more joyous excitement, so I’m totally stealing that segment from them! – O is on a real kick about “loving my family” which means lots of hand holding and lots of long hugs. Such a sweet phase! – Reese’s peanut butter Oreos: They spent a long time working on this flavor combo and holy cow it is good! – My newest SparkleSkirt arrived as a birthday gift to myself. It’s so bright and colorful! I can’t wait to take it out for its first test run this weekend. What making you happy this week? Have a great weekend everyone! My new training plan starts on Monday. I’ll essentially be following the half marathon “run it” training plan from Train Like a Mother, slightly modified for the 13.FUN virtual half marathon. Love that I got a little swag bag for a virtual race! It includes a mix of runs, with long runs starting at 6 miles and progressing up to 11-13 miles, depending on how you want to handle things. The weekly mileage includes some straightforward runs, some with strides thrown in, hill and speed work, segments maintaining your goal race pace and easy long runs. There are also cross training days, “fun” workout days (where your exercise is essentially to play) and specific strength training plans. All in all, a training plan with more specific quality workouts that I did with my last training plan where I focused more on just getting the mileage in. Having crossed a half marathon finish line once in my life already, this time around I know I can do the distance – I want to do it a little faster. 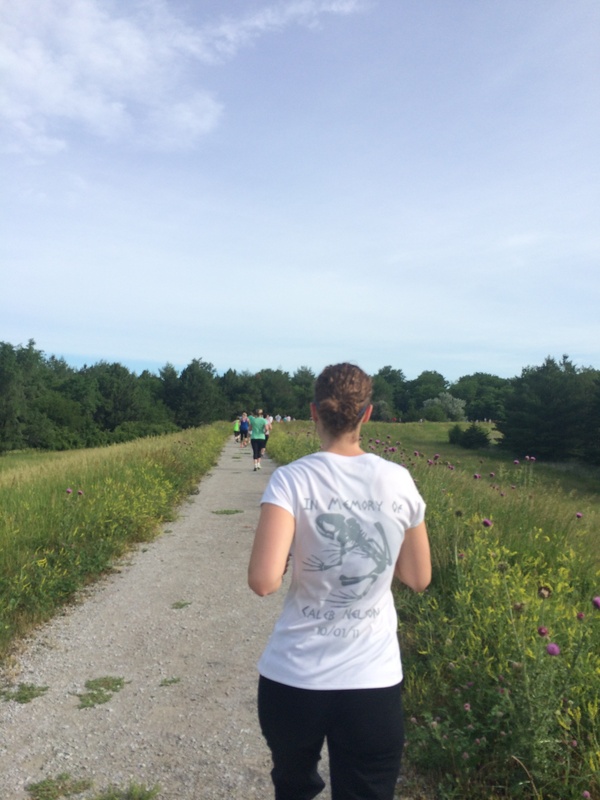 Looking back at my thoughts on my half marathon training cycle for the Princess Half Marathon, there are a few things I learned from that process that I’ll carry with me this cycle. – This time, I’m going to do the workouts in the order prescribed by the training plan as much as possible. Last time around, I just checked the boxes off willy nilly during the week whenever I could get them in rather than following the order in the plan. That meant occasionally doing longer runs on back to back days and rest days thrown in whenever my schedule allowed, not really when I needed them after long runs. This time, I’m going to acknowledge that the people who design training plans put specific workouts on specific days for a reason to maximize the value of those higher quality workouts and minimize injury by optimally timing rest or easy days. There are a handful of longer runs on weekdays throughout this plan, which will require some advance planning on my part in order to make it work. 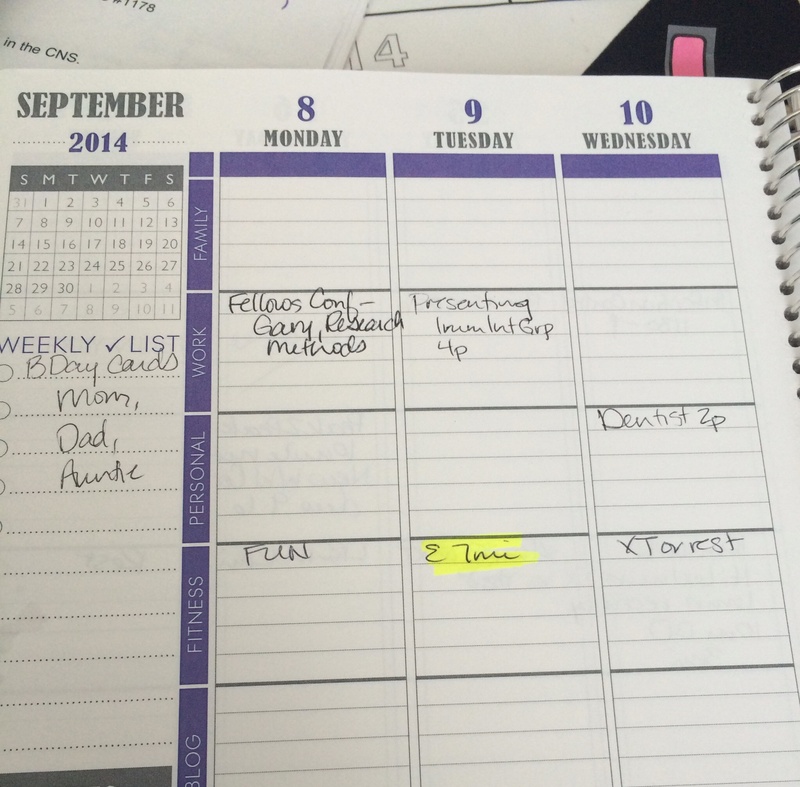 I already have those workouts highlighted in my calendar so I can be sure the I make time for them. Right now the idea of 7 miles on a weekday seems intimidating with my work schedule, but a) hopefully I’ll be a little faster by the time these come up so it won’t take so long and b) I know they’re coming, so I’ll have plenty of time to make arrangements. – This time, I’m actually going to DO THE STRENGTH TRAINING. There is strength training recommended in the Hal Higdon plan, but I didn’t make it a priority. Strength training is so important for running, in terms of keeping you injury free and in helping you gain speed – both things I’m interested in! With this training plan, there is a very specific recommended strength circuit for the first month that I can do at home. The strength routine will be tweaked every month, which should keep things interesting. For the first month’s workouts, I’ve already added notes into my planner for the days I’m planning to do the strength training. It’s twenty minutes and doable with things I already have at home so there is NO EXCUSE for not getting them in (all caps to yell at myself, not at you my dear reader). – I turn 36 next week. I am feeling those years in my hips and knees and back and everywhere else these days. Because I’m not getting any younger and yet am definitely too young to hobble out of the car like I do any time I’ve been sitting a while, I’m going to include foam rolling, stretching and/or yoga as part of each day. – This time, I’m going to allow myself to take the non-running workout option when I feel like it. In my first training plan, I felt like I had to run every run rather than taking the cross training option most weeks. I was afraid if I didn’t run as much as possible, I wouldn’t be able to finish the race. Now I know I’m more than capable of running 13.1 miles so I will trust the training plan and take the rest or cross training option in the plan when I feel like it. I’m looking forward to tackling a new running goal and the challenge of this new training plan. I confess part of me is nervous about the tougher plan, but I can absolutely do this! You never know what you can do until you try and I’m looking forward to seeing how things improve over the next few months. Do you get excited about training for new fitness goals? Sorry for the delay in posting! I usually write posts at night and schedule them to post the next morning, but last night I had a little mom’s night out and got in too late to write. Thus, you’re getting a lunchtime post today. I had a long long day at work and rewarded myself with a trip to see 22 Jump Street at our local theater, with the cushy recliners and $5 Tuesday movies. 🙂 Normally, my husband is the one who takes advantage of the $5 movies but it was my turn this week and I picked 22 Jump Street since I knew Darrell had no interest in seeing it. It was funny and Channing Tatum was charming as ever, so I’m glad I went. 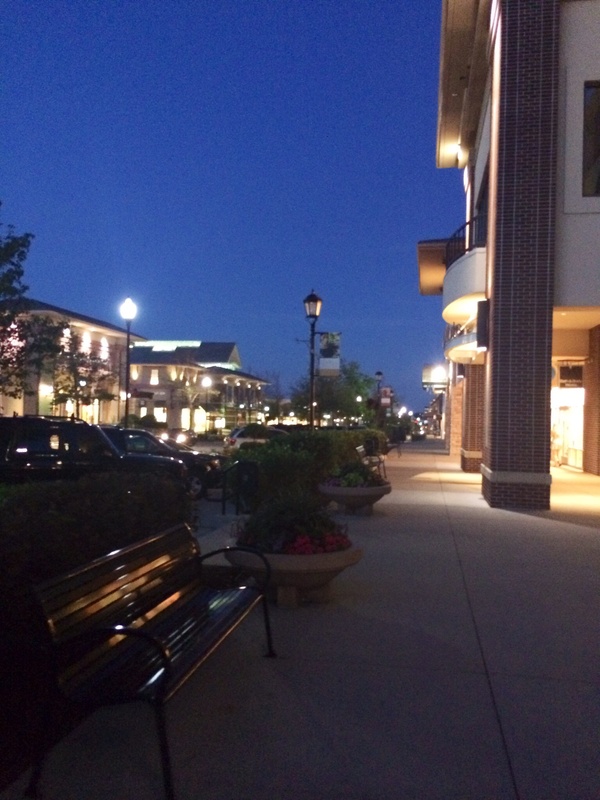 After the movie, I realized I’d been so busy I hadn’t gotten any exercise in for the day so I walked a couple of laps of the outdoor shopping center I was in and called it good for the day. Every little bit helps! While I was walking, I was thinking about this question: Why did I chose Weight Watchers? Twice in the last week I was asked about losing weight and twice I totally flubbed the answer. I think part of the reason I wasn’t able to articulate great answers to how I lost the weight was a) I’m out of practice answering the question as most people I’m around have gotten used to the “new” me and b) I’ve spent more time lately thinking about what’s wrong with Weight Watchers from a maintenance perspective than I have what was RIGHT about it (for me) from a weight loss perspective. I chose Weight Watchers to lose weight for several good reasons and I definitely think it was the best choice for me to lose weight. – Many of the components of the Weight Watchers program (tracking, making small changes over time, weigh in accountability, social support) are things that have been shown in the weight loss academic literature as being keys to success in weight loss. I’m a science-y person, so picking a program that included a lot of elements backed by objective science was important for me. *Note that I said objective science – every program out there says “studies show” from their own internal studies and I ignore that nonsense. – I wanted something that gradually eased me into learning how to make better choices, rather than a drastic (and therefore probably temporary!) change. With Weight Watchers, I started with a certain amount of points and those decreased over time as I lost weight, which made the change in diet more gradual and palatable. – I didn’t want there to be any “never” foods. When I had gestational diabetes, the things I could NEVER have were the things I was always DYING to have. I liked that with Weight Watchers, I could have anything. I just had to plan for it in my daily, weekly or activity points. – I wanted some external accountability and I did not want that to have to be my husband. Having a place to weigh in at the same time every week with an objective outsider being the person who wrote down the number was definitely the kind of accountability I needed to start with. – I wanted to get credit for eating good things, as much as I was learning to avoid bad things, and Weight Watchers can definitely do that if you let it. Yes, you can eat whatever you want so long as it is within your points but it doesn’t take long to figure out that you can eat a lot more mass of food if you eat healthier choices because they’re free or lower point than less healthy foods with the same calorie counts. In this respect, your Weight Watchers leader definitely can be a help or a hindrance. I was lucky to have a leader who really highlighted this idea, more so that pushing the processed junk that Weight Watchers themselves sell. I know that’s not true everywhere, so look around for a good meeting. All in all, it was definitely the best choice for me and I was very successful losing weight with their program. There are definitely flaws in Weight Watchers and I really don’t think they do a good job supporting people in maintenance (both of which are topics for future conversation! ), but it was the best route for me. I don’t know if I would have been successful losing so much weight and maintaining it for a year with any other program. As much as I’m a little disenchanted with Weight Watchers from a maintenance perspective (and honestly that’s probably more about losing the leader I LOVED than anything else), it’s good to remind myself why it was good for me in the beginning. PS Wednesday mornings are clearly chaotic in my house! Last Wednesday morning, I poured chicken stock in my coffee instead of almond milk. This Wednesday morning, I somehow put on my underwear sideways with my hips through a leg hole and then one leg through the waist and the other through the other leg hole. I urge to try not to picture this but trust me, I was confused when I noticed this on my first bathroom break this morning. Oy. Am I the only person who has done this? On our very soggy Saturday morning this weekend, we set out for Lake Zorinsky for the Happy Camper 5K and 1 mile Family Fun Run. 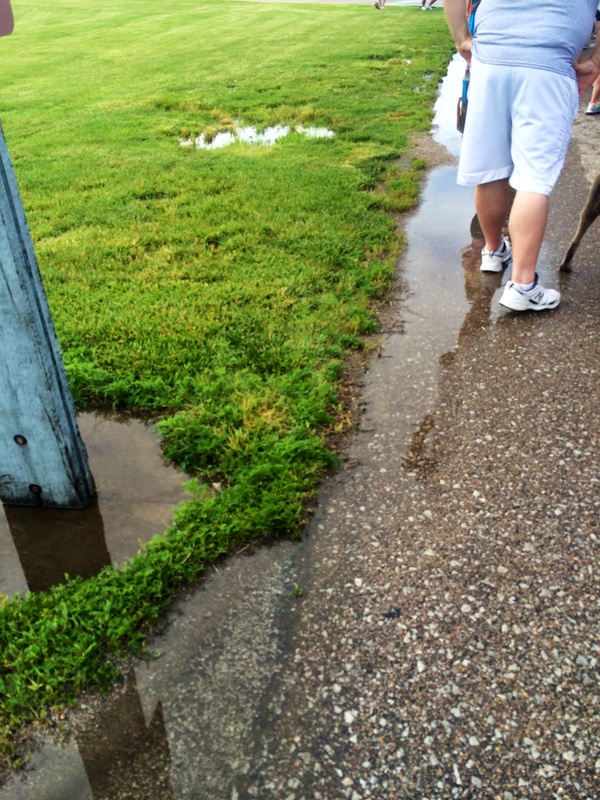 The rain had stopped, but things were definitely wet after a night of storms! When I signed up for the 5K earlier in the month, we’d talked about going as a family because we knew from my prior runs in this park that there was a playground O and Darrell could hang out at while I ran. There was a kid’s carnival scheduled for after the races, so we thought it would be a great family weekend outing. After O had such a good time at the Boys Time race a few weeks ago, I asked Darrell if maybe all 3 of us should do the 1 mile run? It was for a good cause (summer camp for foster kids) and we were all going to be there anyway, so he reluctantly agreed. 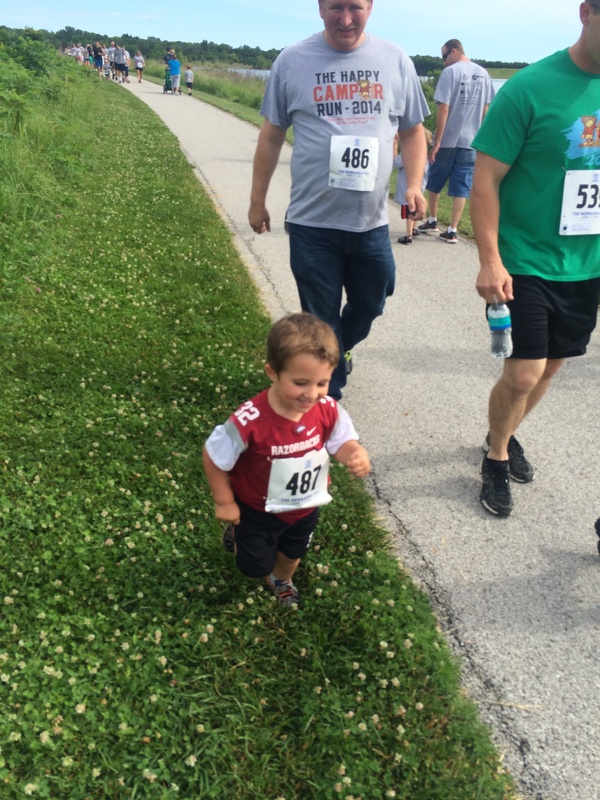 I didn’t realize until we headed out that morning that this would be his first official running event! He is such a great supporter for me, but hadn’t ever signed for any of these himself. I’m glad he decided to come along with us! A big sponsor of the event was a local toy store, so we had the very cool packet pick up I mentioned earlier this week. The race didn’t start until 8:30, so it was nice to get a slow start on Saturday morning (relatively speaking) to get us all loaded up and out the door. Oliver took eating his oatmeal before his race very seriously and essentially followed me all morning, doing everything I did from breakfast to drinking to some yoga stretches to a last minute potty break. Toddlers doing the half fishes stretch are so cute!! Turns out this should have stayed stuck to the bib. Oops! There were a lot of families involved in the race, including strollers, kids and dogs. I spent part of the race running behind a mom and her daughter (about 8-9) doing the daughter’s first 5K race, which was cute. There were lots of signs with quotes from the campers about how much camp meant to them and running jokes written on the path in side walk chalk. There was a mix of sidewalk, asphalt and gravel paths to keep things interesting. One thing I really appreciated about this event, aside from the fact that it was a great family atmosphere, was the fact that there was a crowd of volunteers cheering people in until the very last person came through. That was really awesome! They sounded just as excited for the person who crossed 15 minutes after me as they did when I crossed. Cheering in the finishers down to the last one! Once we hit the trail, he had a great time running along the path with the other kids. It was really narrow in spots, especially since it was an out and back path! I was terrified he’d crash and hurt himself or someone else. Thankfully, the only person he ran into was another kid about the same size at the turn around point and no one hit the ground. He ran about half a mile and then was done, so I carried him the rest of the way. We had a great time chatting with a foster mom with two young boys who were also walking along at the finish. When we got close to the finish line, O got down to run again across the finish so he could collect his applause and his fruit snacks. 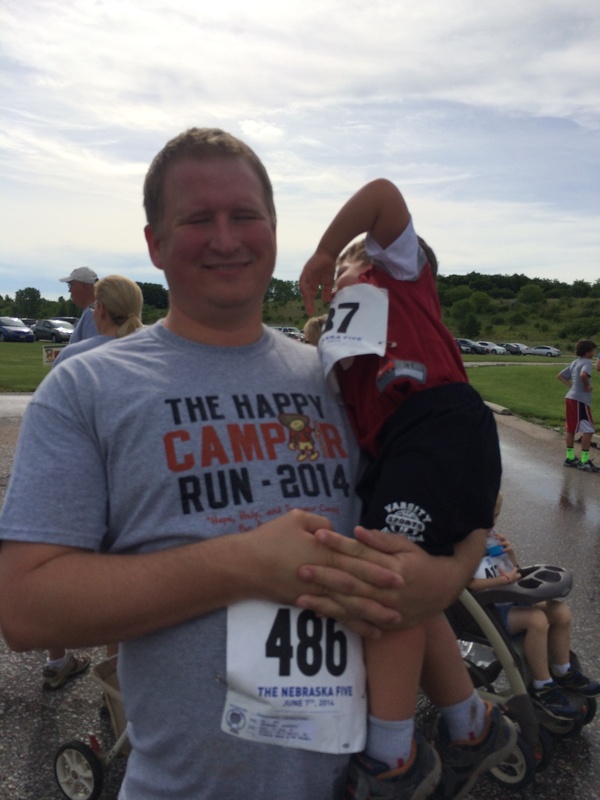 Darrell jogged with us to keep up when we were running, so he really did run his first race. I’m so glad he did it with us, even if he did say he didn’t really see the point and just wanted to donate money next time. He’s a world class supporter even if doesn’t want to be the runner again and I’m glad we all did this together! We tried out a new recipe Friday that the whole family loved, so I thought I’d share. This was inspired by a recipe in this month’s Cooking Light magazine. Oliver and I went through the new edition of Cooking Light at our Sunday morning breakfast date last weekend and he helped me pick out things that looked yummy. He also helped me actually make this dish and both he and my hubby liked it, so it was a winner all around for healthy family living! Cooking Light doesn’t have the recipe up yet for me to link the original, so I’ll just tell you how we did it (which was an easier, lazier way than the original). 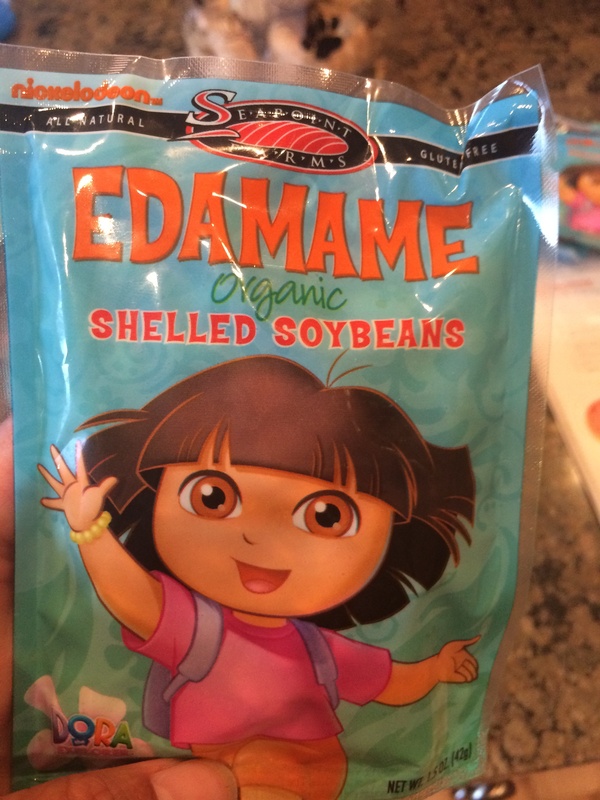 Hubby bought lots of individual packets of edamame – I did loads of opening little packages. Saute garlic in olive oil until fragrant. Add the chicken stock, edamame and shrimp and saute for 5-7 minutes or until shrimp are nearly opaque. Stir in the corn, ranch seasoning, salt and pepper. Transfer to serving dish and toss with the sour cream. 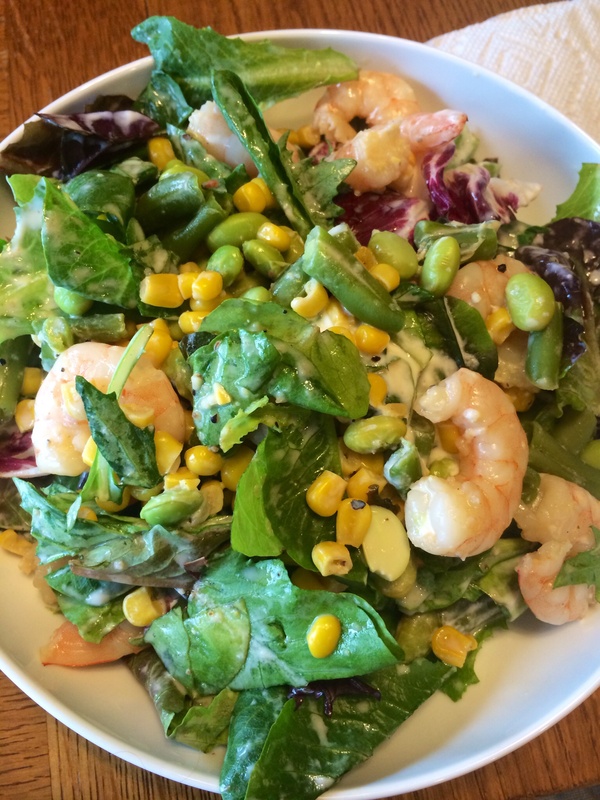 For the adult dishes, we served this tossed with salad greens and the hot sauce. O ate his alone (and ate it even though all of the components were mixed together! Major toddler victory!) without the lettuce because he’s not so into salad. This was a great, fresh summer meal. I’ll be having the leftovers for cold lunches this week and will definitely let you know if it doesn’t hold up well but I suspect it will. I’ll be sure to update this with the Cooking Light recipe link when it is available. Their version included homemade shrimp stock from the shells, which I’m sure was delicious but my version was weeknight doable. Really, you could probably microwave the corn and edamame and use cooked shrimp (like a cocktail tray) if you were in a hurry. We’ve gotten in the habit of eating three different meals far too often (toddler food for O, WW food for me and normal food for Darrell) so something like this, that works for all of us, was a great change of pace. We’ll definitely be testing out some new recipes this summer for the whole family and I’ll keep you posted with the winners like this one. For most of the last two years, shrimp was the only meat O would reliably eat so this was a good starting point for us. Do you have any new recipes to share? 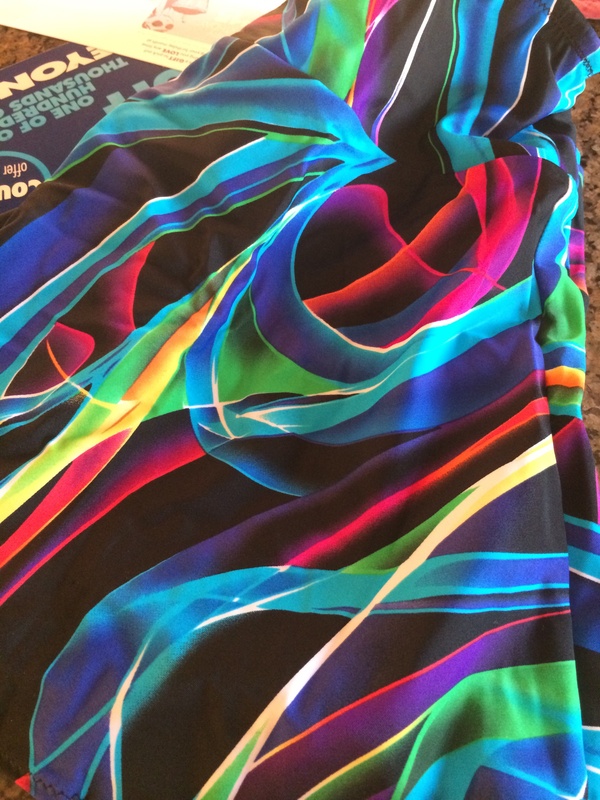 Weekly Wrap Up: New training plan has arrived! I spent far too much time this week going through the new training plan for my half marathon and checking it against the other things on my calendar for the next few months. There is something so soothing about list-making and calendar sorting. 🙂 Or maybe that’s just me? 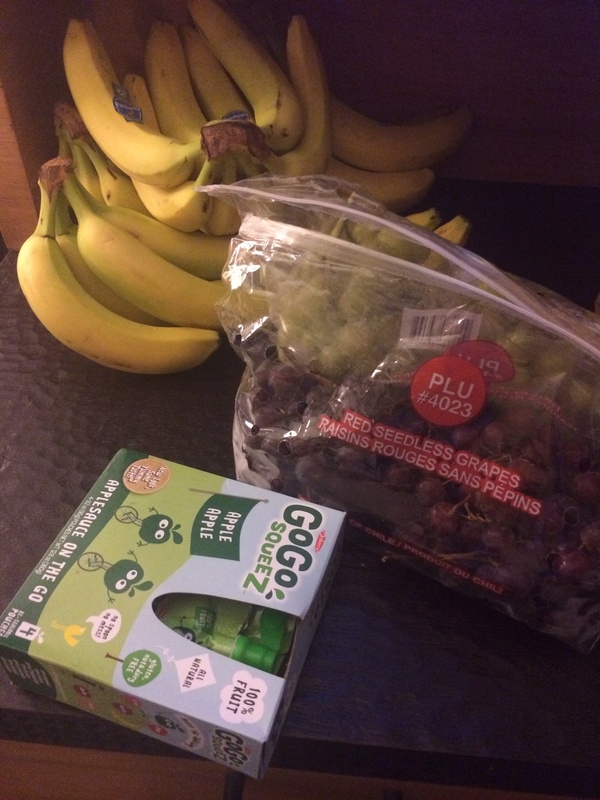 I’ll need to update the half marathon training plan page here on the blog. As of June 30th, I’ll be back on a training plan and looking forward to it. In the meantime, my plan to ramp up my running this month so I’m ready for the workouts that are coming soon is going well. I’m on track to hit my June goal of 50 miles, which is a good feeling. Monday 15 minute walk around campus between meetings – I’m really enjoying getting out for a little walk during the day! I’m so much more productive after a little bit of a break outside. Tuesday 3.22 miles in 36:36, a nice easy pace. I’d planned on 3 miles but tacked on a little extra for Laura’s virtual 5K to celebrate her blog’s one year anniversary. 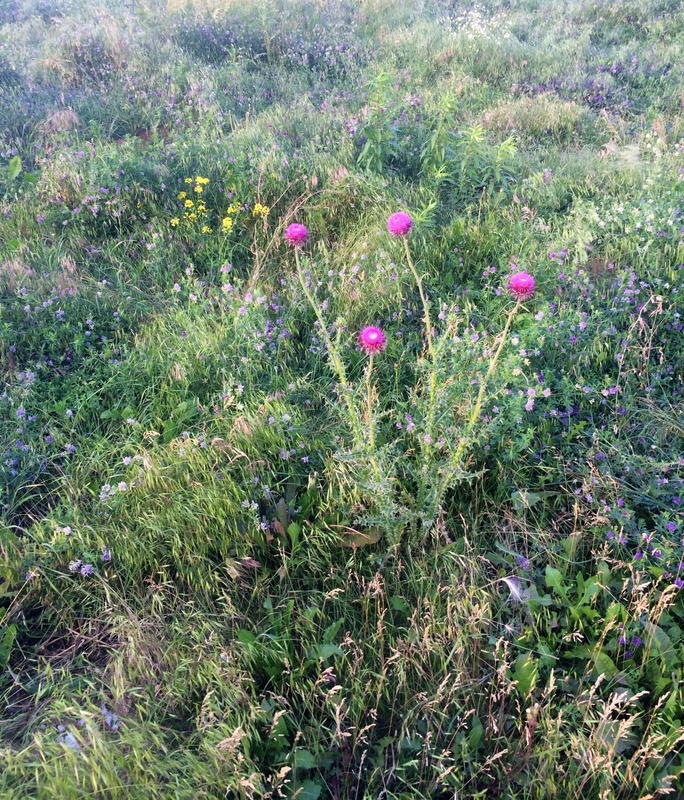 I know they’re weeds, but they’re lovely weeds! 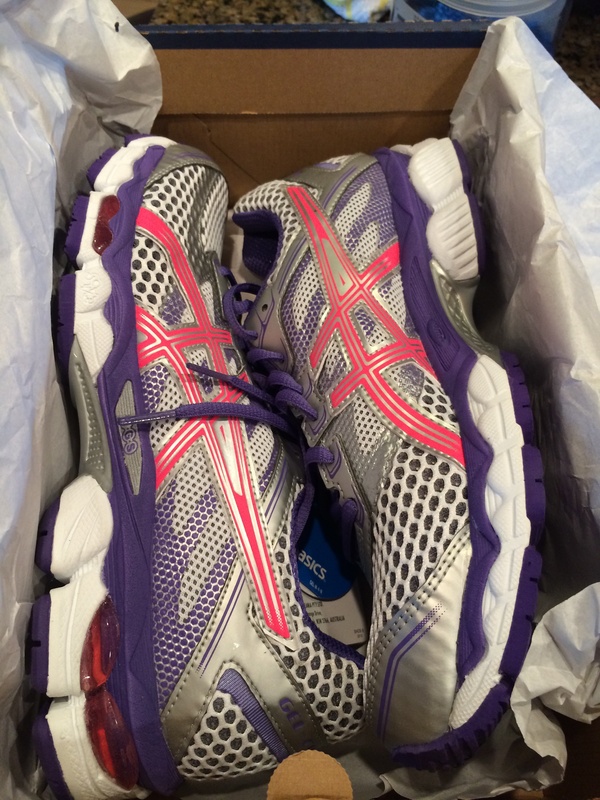 Thursday 3 miles running in 36 minutes for a nice easy warm up for my new shoes, which felt lovely! It made up for the tough, early morning due to Oliver’s aquarium battery dying. It’s amazing how much little things like that will screw up your morning! 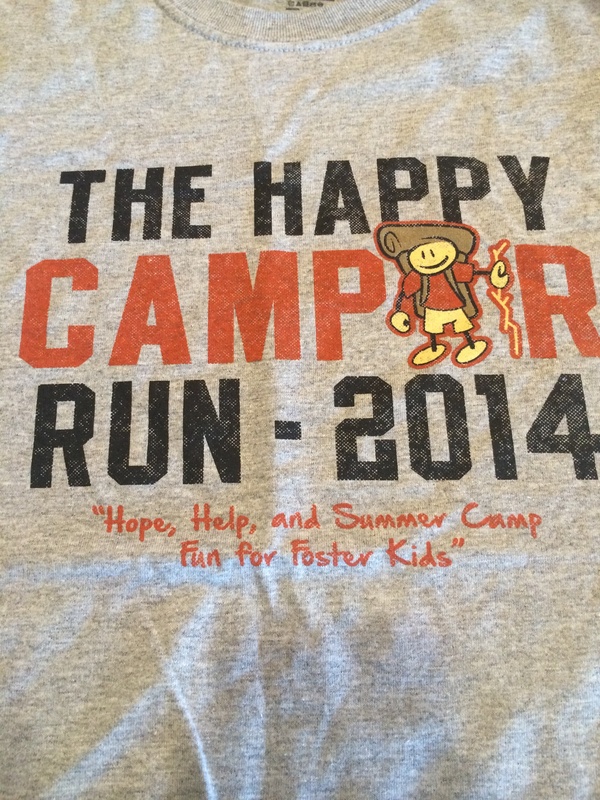 Saturday The rain stopped so we all headed out to run at the lake for the Happy Camper 5K. 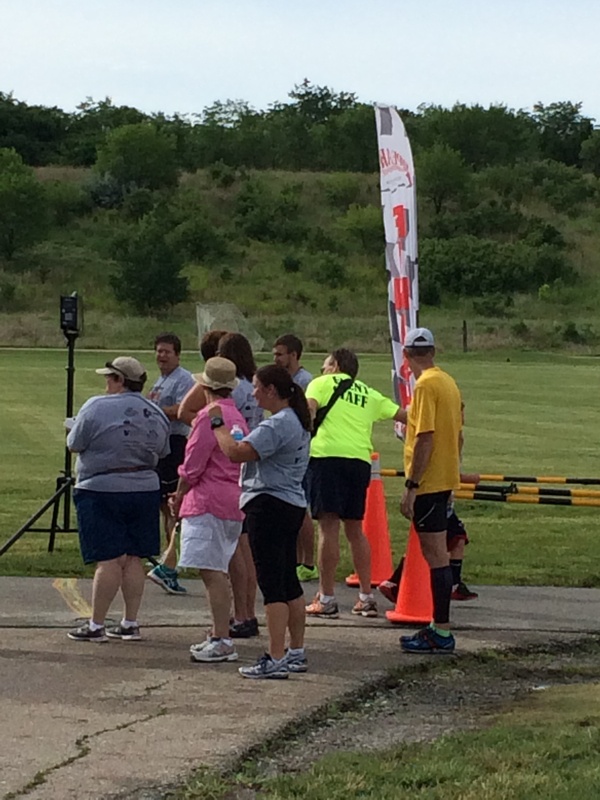 I ran the 5K and then as a family, we ran/walked the 1 mile afterwards. I decided that counted as my “long run” as the week, especially as I was either running with Oliver during the one mile part or carrying my 35 pound toddler during the rest of the mile. It all felt as physically taxing as a 4-5 mile run would have been! Given the soggy conditions, I decided to back off on my time goal of less than 33 minutes that I’d set back when I made my June goals. I love running around this lake, but with the path being covered in wet leaves after the storms overnight, I didn’t want to risk falling. I’ve already crashed on part of this race course on a long run back in Princess Half Marathon training so I know how treacherous it can be. Surprisingly, even with the soggy conditions, grassy patches, sections of trail, and stopping for pictures, I finished in 32:40. That bodes well for my goal to pick up a real 5K PR sometime later this year. Sunday Today, I think I’ll just do whatever I want for a workout! No real plan – just moving in whatever sounds fun once I get done with this morning’s breakfast date with Oliver, grocery shopping and Weight Watchers meeting. Here’s hoping you all have a lovely Sunday! Thanks for all of the great book recommendations! 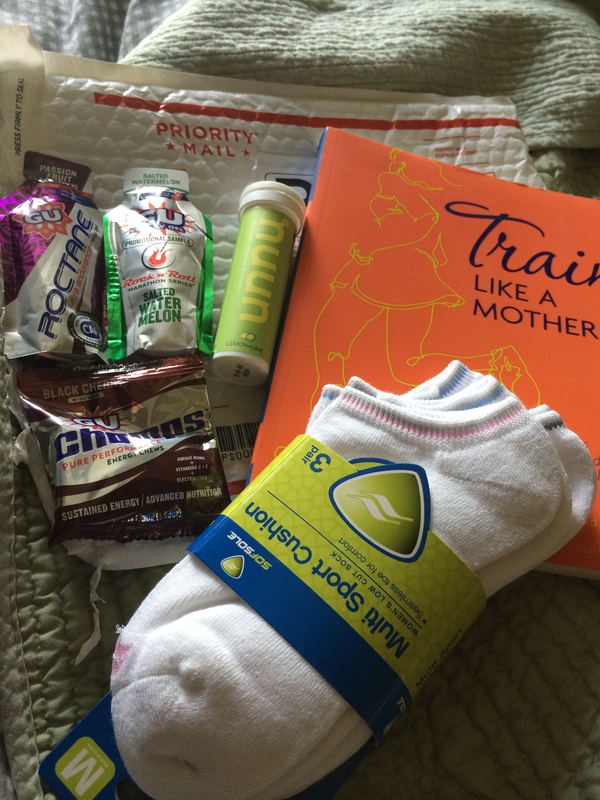 The winner (per random.org) of the signed copy of Train Like a Mother is Annmarie at FitFoodieMama. Email me at littlemoreeachday@gmail.com so I can send the book your way! Last night was an almost perfect summer evening. I picked O up from school (and answered questions about Weight Watchers on the way out – I’ve got to get better at answering those questions on the fly!). 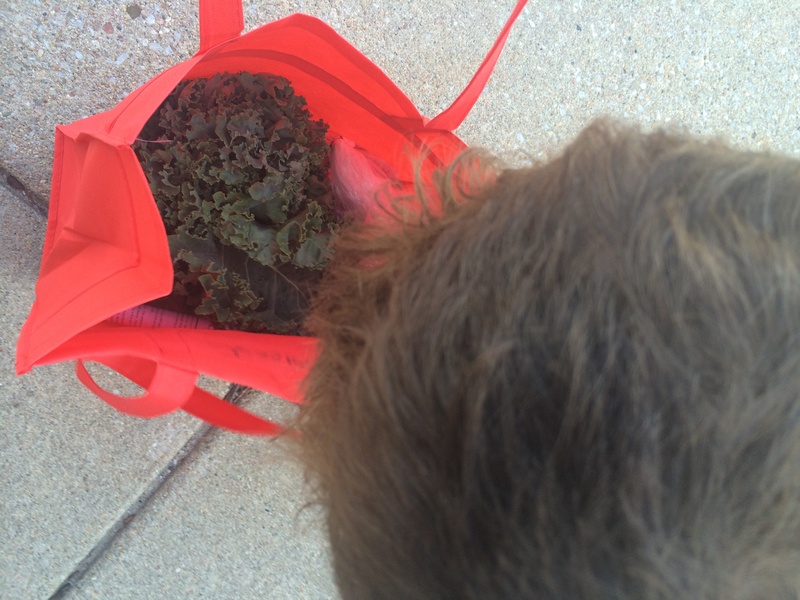 We headed over to pick up our bag of goodies from the CSA. This week we got kale, a loaf of low carb bread (a little odd), beets, strawberries and zucchini. O loved the little beach they’d set up in the parking lot! For some reason O thought the little guy was a monkey! 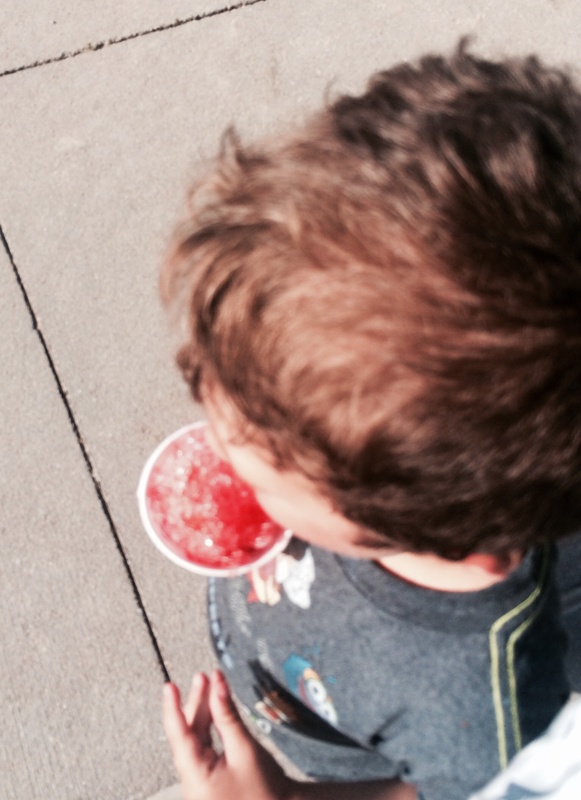 O got his first snowcone while we were there too. Thanks to Mickey Mouse clubhouse, I got to hear repeatedly on the drive home exactly why the shape was a cone. And all worked together to make a fantastic dinner (recipe coming next week!). We went to sleep to the sounds of a summer storm. It was an absolutely fabulous evening all around! Hopefully it won’t rain us on this morning as we all head out for our family fun run! Send good, dry vibes our way!